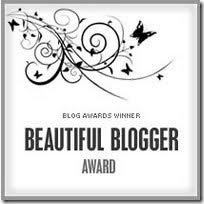 Yay, I just received my very first blog award from the very sweet n' sassy Bellisimama of Bonfire of My Vanity. Thank you, sweetie, you made my day! When I started this blog in December, I really didn't think anyone would read it and here we are, 3 months later with so many fabulous readers and fellow bloggers! This blog has turned into such an important part of my life. Being a stay at home mom, I don't get out much and don't have a lot of time or energy to do so many of the messy hobbies that I love, so Va-Voom Vintage has really helped to be both a social and creative outlet for me. I get on every morning, squealing with delight when I get a sweet comment or another follower and as I clean the house or change diapers, I'm always brain storming about my next post idea. I love so many blogs and read them every day but I'm extending this award to 3 very glamorous and talented ladies, Charlotte of Tuppence Ha'Penny, Vivian of Vivian Von Dimples and my new vintage bestie and fellow Missouri gal, the pin up momma at Journey of a New Pin-up. Please go check out their blogs!! 1. )I'm addicted to America's Next Top Model- cause I'm FIERCE! 4. )I hate to drive. Pj pretty much drives everywhere we go. I only drive if I have to and when I do, my blood pressure is through the roof! 5. )I have no idea what my natural hair color is. I'm serious! When I was a little girl, it was white blonde, as I got older it darkened a bit and them I started dyeing it. It's been black, blonde, red, orange, blue, brown, had rainbow streaks, etc. 6. )I still don't know what I want to be when I grow up. For now, I'm a stay at home mommy and I LOVE it but one day, all of my kids are gonna grow up and I don't know what I'll be doing then. I'm a certified wedding planner but I don't know if I'll want to be doing that when the time comes. 7. )If I could pack up and move today, I'd move to St. Augustine, FL. I honeymooned there and fell in love with the city's history, people, climate and of course, the ocean. I loved it so much, I named My daughter Olivia Augustine Elise. Hopefully, we'll move there someday...or at least buy a vacation house there! lol I about flipped when I saw my blog up there! Thanks what do I do now lol?? Congratulations! I really enjoy your blog and will definitely be checking out the three blogs mentioned above! I loved reading your little tidbits....I am SO right there with you on the cookie dough right out of the package!! YUM! Congratulations on your award! You have a fab blog :) And sunlight is one of the best things you can do for SAD, so don't feel embarrassed if it makes you feel better! Eating carbs can help too, as they contain the precursors for serotonin. You could help ladies plan vintage weddings? That almost sounds like the ideal combination!